All our fairground equipment is fully and independently tested under the ADIPS system, approved and authorised by the Health and Safety Executive, and below here is a full explanation of how this works for the interest of our clients. We will be delighted to provide copies of our Model Risk Assessment, Method Statements and Child Protection Policies. Our safety policies have been used as models by other agencies. 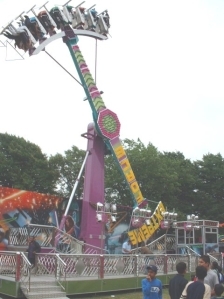 Fairground Safety is a matter overseen by the Health and Safety Executive who work in partnership with the Showmen’s Guild of Great Britain to ensure that all equipment and fairgrounds are properly organised, managed and supervised. The guidance on safety at Fairgrounds can be found is publication HSG175. These inspections must be carried out by independent inspectors who are certified under the ADIPS inspectorate which is the body also responsible for theme parks and other static leisure attractions and is recognised by HSE as the relevant body for the UK. ADIPS certification is also recognised across the EU and complies with both BS and IS requirements. In the past there were separate forms for each of the above that had to be held by each operator with their equipment and that could be inspected by local authorities or other interested parties. However this system was changed and now an enveloping document, the ADIPS DOC, includes a summary of each and every necessary check so that bodies only need to check the DOC and not the various elements contained within them. The DOC shall be issued to the date of the earliest expiry of any of the relevant tests required. For example, if a NDT is carried out in February 2007 and would last for the 12 months, but the relevant electrical test was carried out in September 2006, the DOC would last up to September 2007, 12 months after the date of the electrical inspection. Upon completion of a new electrical test, the document would then be dated up to February 2008, 12 months after the NDT. Because of this, most operators seek to have all their inspections undertaken at around the same time each year, albeit by different engineers, specialist in their own areas. As with a car MOT Test, after the engineer has inspected the equipment they will provide a list of any work required to bring this up to a standard that will be guaranteed to last for a full twelve months. All such work must be fully completed and reinspected before the ADIPS certificate is issued. Because of this rigorous inspection regime, fairground equipment operated under the Showmen’s Guild of Great Britain has a superb safety record, which is better than any other leisure activity in Britain today. We are at the forefront of improving safety standards even further. We drew up the model risk assessments for individual rides and have now improved our overall risk assessments. We are working with HSE on Maturity Risk Assessments, which are the guidelines needed for older equipment that do not have a Design Review from manufacturers because of their age. All our equipment is powered by diesel generators, screened, super silent and safe. These are tested as part of the overall inspection of the equipment for the ADIPS certificates prior to the event. We will be delighted to supply specific Risk Assessments and documentation for each and every event in which we participate.